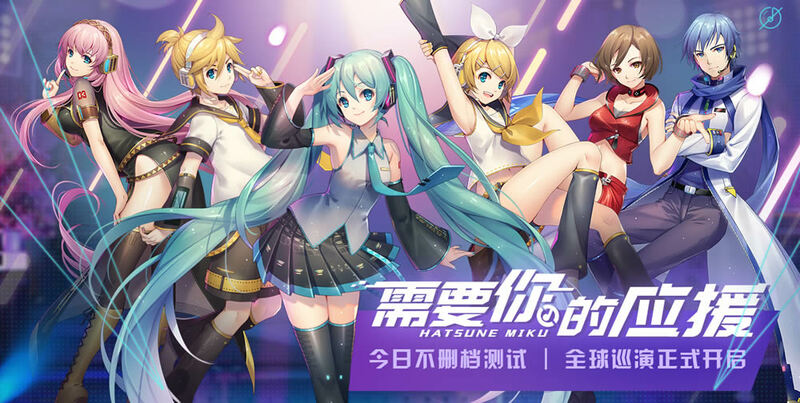 After a 2 year development, and rework after changing developers, and MANY months of beta testing, the long-awaited Hatsune Miku: Dreamy Vocal mobile game from China has finally been released to the open public! The mobile rhythm game featuring Hatsune Miku and the other Cryptonloids is available for Android and iOS. And yes, it’s playable from anywhere around the world! To download the game, just be sure to keep the main website in Chinese language (do not let it auto-translate) on your mobile device, and click the prompt at the top of the page to start the download. If you’re on PC, you can download the files via the links on the right side of the main website. Android users can simply download and install, while iOS users will need to use a Chinese app store account. After that, you just need to login once using either the WeChat app, or the QQ messenger app. Then you can enjoy the game! Keep in mind the game of course has a Chinese-only interface, but don’t let that stop you from exploring and having fun! The game is simple enough to figure out, and a lot of fun to play! Also released with this update is the song “越过海岸线” composed by kz and Mes. This is also the secret “new song” leaked for the MIKU WITH YOU 2018 setlist for Beijing, and will be played live in concert! The main visual art for this release was created by the illustrator TID. Game launch theme song by kz and Mes.